You are standing up in front of a group to speak. You only have a few seconds to convince your audience that you are worth listening to. 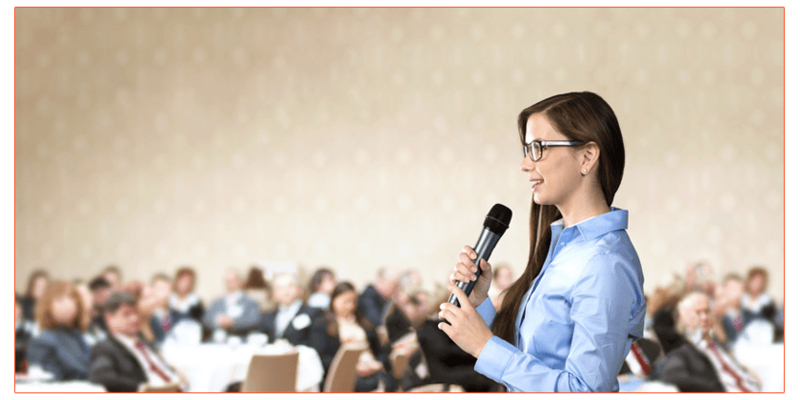 How to develop your personal credibility in public speaking so quickly? Often you can earn credibility before you even open your mouth. Many presenters rely on an introduction to earn credibility. You see this technique often in show business and in conferences. An MC will introduce a performer with a little hype or a moderator will read a speaker bio outlining experience, education, and other credentials. If you don’t have a colleague to help develop third-party credibility, you are going to have to do it yourself. You can’t simply start reading your bio or bragging about your accomplishments to develop your personal credibility in public speaking. Rather, you are going to build credibility in a few seconds by demonstrating both confidence and competence. First, dress to inspire confidence. The key is to dress appropriately for the audience in front of you. If you are speaking to a large group of colleagues, business casual might be exactly right. In another situation like a formal press conference, you might have to up your game to a business suite. Before you agree to speak, find an insider who will tell you what kind of apparel is appropriate for your audience. Secondly, use non-verbal skills to build confidence. Before you say a single word, simply look at your audience. Stand up straight with your hands relaxed at your sides, make eye contact with audience members, allow a second of silence before you talk. Let the audience look at your confident body language. There’s no need in a rush to speak, use a second or two of silence to grab the attention of audience. Third, sound confident. The first words out of your mouth need to be bold, clear and strong. Before you heat the stage, make sure you have a complete vocal warmups and enjoy to sip a room temperature water. Your look, your non-verbal’s and your vocal quality are there ways to quickly demonstrate confidence. First, never agree to speak on a topic that you know little about. I was recently asked to speak to students group about a job interviewing skills. Since I haven’t personally interviewed for a job since 2000, I didn’t feel qualify to speak to modern audience about interviewing skills. I told the event coordinator that I would be happy to talk body language and confidence building, but if I could personally claim no first ten experience and successfully interviewing in this job market, in this century. Tell the audience why you are competent, the simplest way is to find one or two pertinent details in you background that relate to the subject matter. The audience doesn’t need your complete resume, just a brief detail or two. You don’t need to mention your education or job experience, none of those qualifications are relevant, but under 10 seconds I have demonstrated competence in the topic. Take some times to judge down the specific details in your background or experience that relates to subject matter competence. When you demonstrate confidence and competence, then you can develop personal credibility in a matter of seconds.